Jewelry is NOT indestructible! It will scratch and metal can break or gems can crack, especially if you're hard on your jewelry. Normal wear and tear is going to happen no matter how careful you are, but following these guidelines below will help keep your handmade jewelry looking new and make it last longer. - One good rule to always remember, jewelry should be the last thing you put on when you're getting dressed (this includes perfumes and lotions) and it should be the first thing you take off when you're getting undressed. - When you're not wearing your jewelry, always store it in a cool, dry place. It should also be stored separately from your other jewelry to avoid scratching the pieces. (zip lock bags work great). Arte Designs includes a zip lock bag and jewelry box with every order. - It is natural for sterling silver to taint over time. Keeping your sterling silver jewelry stored in an airtight zip lock bag will help prevent some tarnishing. Sterling silver is meant to be worn and your body oils will also help prevent tarnishing. However, you will still need to polish your sterling silver. - Never sleep, shower, do dishes, swim, or clean with your jewelry on. Chlorine, salt water, household cleaners, detergents, and lotions can cause discoloration. They can also loosen your gemstones and increase your risk of losing your jewelry down the drain. - Never use paper towels, tissue paper, or toilet paper to dry off jewelry. These things are abrasive and will scratch your jewelry. Always use a soft cloth to dry your pieces. - To clean sterling silver around set gemstones, I recommend polishing your pieces with a non-scratch micro-abrasive polishing cloth. You can purchase one here from Arte Designs. - For gemstones and pearls, I recommend using a damp cloth (with water) to gently wipe the pieces. Never use ultrasonic cleaners and chemicals on gemstones and pearls. Never immerse them in water (if the gemstones are in a setting, they can become loose). Also, never use a silver polishing cloth directly on your gemstones and pearls. - Feather jewelry should be stored separately from your other jewelry and either on a flat surface (the jewelry box we provide works great) or you may hang up your feather jewelry to prevent them from getting bent. If you need to clean them, I recommend using water only and let them air dry. 1. 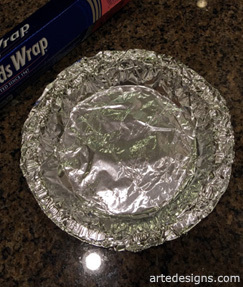 Line the bottom of a pie pan or bowl (anything that will hold water) with aluminum foil. 2. Lay your sterling silver jewelry on top of the foil and make sure all of it is touching the foil. 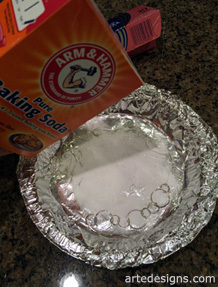 Sprinkle about 1-2 tablespoon of baking soda on top. 3. Heat a cup of water in the microwave for 1-2 minutes (close to boiling) and pour on top. Completely submerge your jewelry in the water for a few minutes. I like to flip the jewelry after a minute or two so the top side can touch the foil, too. You may smell sulphur during this process, which smells like rotten eggs (this is normal). 4. Remove the jewelry and rinse in cool water then pat dry with a soft cloth. 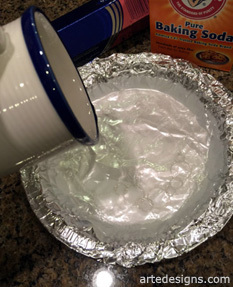 For extremely tainted silver, you can repeat the process, but use new foil, baking soda, and water each time. If you have any questions about caring for your jewelry, please don't hesitate to contact me. Thank you! Arte Designs guarantees quality handmade jewelry, but like any product; jewelry can be damaged and will not last long if proper care is not taken. Here is some information to help you care for your Arte Designs jewelry. Care For Your Sterling Silver Jewelry, Gemstones, and Pearls.